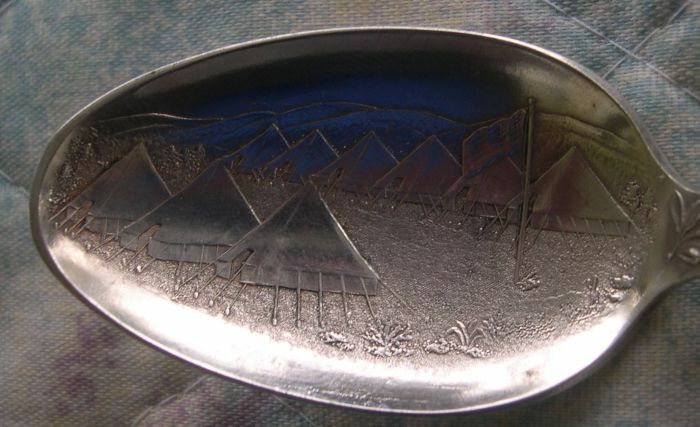 This spoon brought a portion of history to my attention. I was unaware of this part of the American/Mexican relationship. The top picture shows a soldier standing guard and below is an eagle shield with the words "E. Pluribus unum"
Below the shield are crossed American flags with the words "National Union"
The border war was a series of incidents lasting from 1910 to 1919. The major activity was in 1916. After the Mexican Revolution of 1910, the US Army was stationed along the border. In January of 1916 there was the San Isabel Massacre where the Villistas raided a train and killed 18 Americans. In 1916, Pancho Villa attacked the town of Columbus, N.M.
Gen. Pershing launched an attack to capture Villa. The campaign was partly successful in that many of the Villistas were killed, but Pancho Villa escaped. A couple of other American border towns were also attacked. In April, President Wilson ordered the National Guard to re-inforce the border army. In June, the 10th Cavalry 'Buffalo Soldiers' suffered a defeat at the battle of Carrizal. There were a series of other raids and skirmishes starting in June which lasted for several years. Gen Patton (8th Cavalry) conducted America's first assault using armored vehicles (tanks) at San Miguelito, Mex. The First Aero Squadron flew its first wartime support mission to support the troops . Silver plated spoon showing a Mexican soldier/rebel. I am not sure if the style of armaments is correct. 52 border boundary monuments were erected from 1849 to 1957. Most were simple stone mounds without mortar, but seven were substantial monuments of marble or cast iron.